We launched the Like button at last year’s f8, and it quickly became one of the most popular tools on the Internet. As we have continued to introduce more features on Facebook Platform, now more than 500 million people engage with Facebook across more than 7 million apps and websites every month. Compared to f8 last year, this is close to double the number of people and triple the apps and websites. As part of f8, today we announced Timeline. Timeline is a page on which you can put the events and activity that matter most to you. We provide some of the most important stuff that you’d want to put there, like photos and major life events — but those types of content are really just the start. 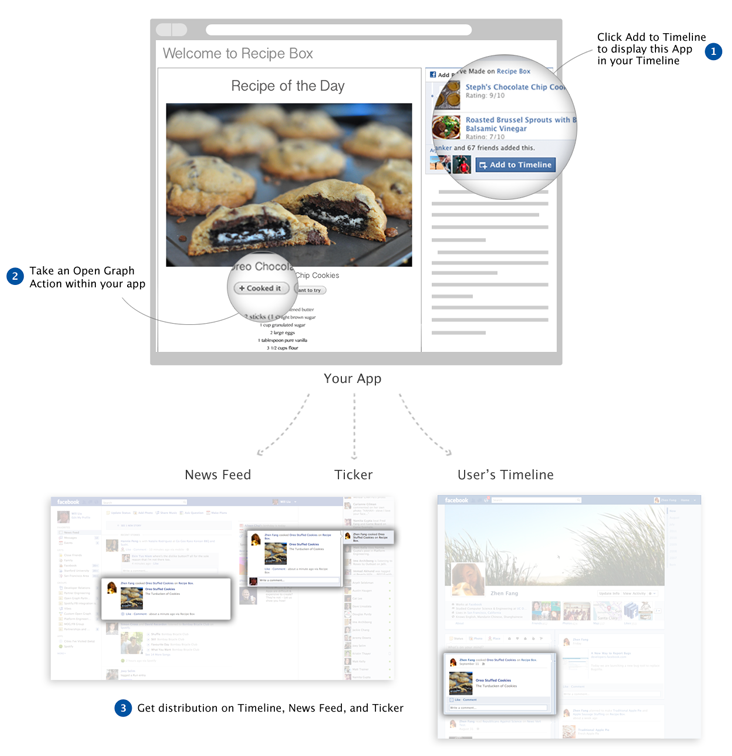 With the Open Graph, you, as Facebook developers, can enable people to truly make their Timelines their own. For example, I love to cook. I want an app that lets me add the recipes I cook on my profile, and at the same time, discover my friends’ recipes. The opportunities are endless, such as building an app for runners to share their routes and achievements, photographers to feature the photos they take, and music lovers to share their playlists and top albums with friends. Develop Open Graph apps that will make Timeline the personal, expressive page we believe it can be. Graph Rank is also personalized. We know people are friends with both their college roommates and their colleagues at work, and those relationships are different. Just because my mom is interested in the movies I am watching doesn’t mean she is interested in my Github checkins. Graph Rank isn’t a global score, but a personalized view of you and your friends’ tastes. As the Open Graph opens up Platform to more categories and verticals, many more types of apps will be successful on Facebook because Open Graph isn’t just about sharing – it’s about self-expression and serendipity. Whether you have a Website, App on Facebook or Mobile app, you can make it Open Graph-enabled so users can see their activity on Timeline.